Today Intuit, the makers of QuickBooks(tm) accounting software, gave startups and entrepreneurs a great lesson in how not to run a promotion. I outline what Intuit did wrong and what we can learn from it. I also reiterate my respect for the software itself, marketing foibles aside. Before I trash the marketing geniuses at Intuit, I need to first affirm my conviction that QuickBooks remains a must-have software for any startup or entrepreneur taking themselves seriously. It's so feature-packed, at such a reasonable price, you are foolish if you still keep your accounting records in a spreadsheet or, worse, the proverbial shoebox. What I am critical of today is the way Intuit has botched a one-day promotion. Instead or winning fans, I'll bet they've got a lot of annoyed people questioning their credibility. Let's just say that in the time I was on hold waiting to talk to people at their call center, I went from a cold start to getting this far in writing this blog posting (it was nearly a 20 minute hold time mid-morning today). On Friday morning affiliates like me received an email alerting us to a sale, a one-day sale, offering supposedly sizable (40-50%) discounts on QuickBooks software. We were told not to post the links earlier than today and that the sale price was only good for one day. So far so good. 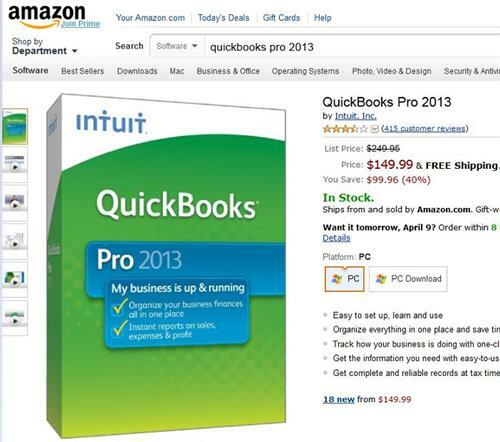 Today I went to the Amazon.com site to see at what price they were selling the QuickBooks software. I don't want to promote something to you, my readers, just because I get a commission. Like you, I too want the best deal. Well, once I got to Amazon I saw they were offering QuickBooks at the exact same price (I don't know yesterday's price to compare). All of a sudden this great one day sale isn't looking so great. This now removed my desire to spend time on promoting this incentive. I then clicked on the QuickBooks link here on my homepage to see what my readers would experience. 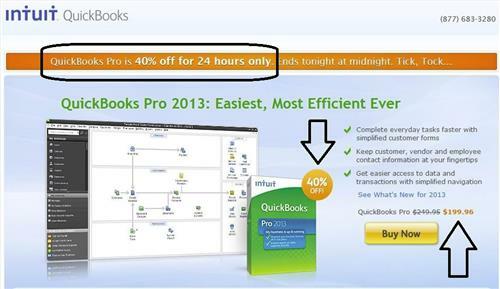 I've highlighted two areas on the screen where "40% off" is promoted. However, the price showing is actually only 20% off. Here's what they saw. So what happens when you actually click through? Does the website then give you the 40% discount as promoted on the screen above? Nope. You are still quoted a price that's 20% off the list price. Now to the next lesson we learn from Intuit's mess-up today: Test, test, test. Had someone inside Intuit taken the time to think through all the possible channels and links that people buy their products, they would have made sure these proverbial ducks were lined up and ready to go. Lesson #2: Make sure you test, and then test again before putting a new promotion in front of your customers. Don't let your customers find mistakes you should have found yourself! Clearly, someone in marketing failed to coordinate with the web development people over at Intuit. So now it's time to call the toll-free number to see if they can help. 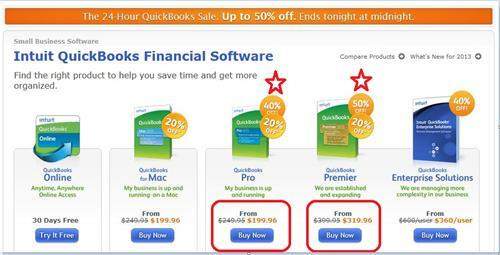 The recording suggested going to quickbooks.com/sales to buy the software at the promotion price. Here is what the user saw at approximately 11 am EDT, well into the day on what is supposedly only a 24 hour promotion. As you can see, the prices don't match the promotion being offered. Upon click-through that same higher price was what showed up in the shopping cart (red stars and red boxes added by me). I then decided to call again and this time stayed on the line until I spoke to a person. It took nearly 20 minutes on hold until a person came on the line. The gentleman I spoke to at Intuit's call center was awesome, absolutely made Intuit look great. Dwayne? Doug? Not sure of his name, but he was a real pro. This is when I learned the only way, at that time of day, anyone could get the discount was to call themselves, wait on hold for a long time, or go to Amazon.com (affiliate link) to buy the software. I ended up going to Amazon to buy my updated copy. Lesson #4: Make sure you've got all hands on deck and prepared BEFORE you go out with a highly visible promotion. But do not promote beyond your organization's capacity to respond. One other thing that came to mind: Intuit makes TurboTax software (affiliate link). We are one week away from tax day, clearly still in the peak season for this product link. Already, the Intuit call center and personnel are taxed, so to speak. 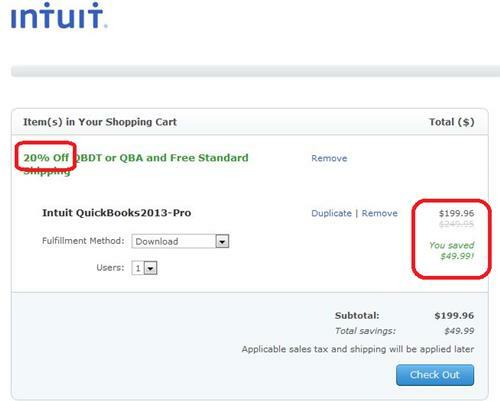 Overall, my assessment is that there is no excuse for Intuit to have messed up today's promotion as badly as they did. They clearly aren't new at selling software through multiple channels. Again, I think the software itself is and remains wonderful. Like I said, I just bought my own updated copy today. Intuit's sloppiness today reeks of an executive or two who pushed through a promotion too fast. Perhaps there was ego, perhaps politics, perhaps inexperience? Perhaps it's all three. I wouldn't be surprised if it was a combination. Either way, there is one final lesson to be learned when you and/or your team mess something up like Intuit did today. You've got to do a postmortem. I'll write on how to do that next time. By around 3 pm EDT, here's the new screen shot I captured at Intuit's website. Finally, with most of the business day shot on this over-hyped one day promotion, at least some of Intuit's screens have caught up with the marketing message that's been on the street all day. But my affiliate link on the right column still only gives you a 20% discount even though it's still got that 40% off banner across the top. Bottom line: When running your own promotions, learn from the mistakes even an old hand like Intuit made today and you will go far.